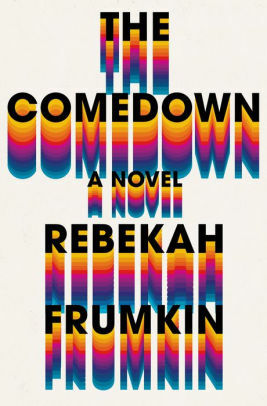 The Comedown by Rebekah Frumkin is a recommended intergenerational family drama following three generations of two interconnected Cleveland families, one black, one white, from the 1970s to 2009. The drama centers on a 1973 drug deal gone bad and is concerned with a missing suitcase that may contain a quarter of a million dollars. Leland Bloom-Mittwoch, a drug addict, witnesses the shooting of his dealer, Reggie Marshall. Leland takes off with a suitcase full of cash. The story is then told from the multiple viewpoints of members of both Leland’s and Reggie’s families for the next 30 years. The novel is less of a mystery with members looking for the suitcase, than it is a compilation of character studies. Each character has a chapter to discuss their formative years and a crucial event during that time that other characters share. Since the novel opens with two pages of family trees, that fact that it is a heavily populated novel shouldn't be a surprise. Frumkin places her various characters in the same historical events from different points-of-view. She has her characters throwing blame for their misfortune on the other family. Her flawed characters deal with mental illness, secrets, self-delusions, addiction, poverty, and racism. The Comedown is an ambitious debut novel with a complex plot set in a well-researched historical context. It is also a novel that didn't completely work for me. The individual stories are very strong, engrossing character studies, but there are an overabundance of characters, several of which didn't need to be a part of the novel. There didn't need to be quite so many characters because, at the end, there was a lack of a coherent connection between all of the characters and a plethora of loose ends never addressed. As a reader, this bothers me. I was also not a great fan of the style in which the novel is written. The quality of the writing is quite good, however, which places Frumkin as a novelist I will watch for in the future. Many people liked the novel much more than me, so I'm sure that my issues with it are more a matter of personal preference. Disclosure: My review copy was courtesy of Henry Holt & Company.